There are 9 images tagged with “mist”. This picture was inspired by an EarthShots photo of a cheetah in a field of grass. But my subject is a little safer! I did this piece for the E-On Software 3D Environment Competition 2012. It was inspired by a visit to my grandfather&apos;s timber farm. I wanted to capture the cool blue mistiness of the woods on a cold morning. 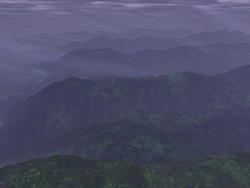 I created this with Terragen 3D landscape generation software. 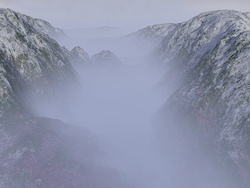 This was made in the Terragen 3D landscape generation software. I was using the original version of the software, now known as Terragen Classic, which didn&apos;t allow for any objects such as plants, just a basic landscape and atmosphere. It was also the freeware version not for commercial use, so I couldn&apos;t render very big images or sell prints of them. But it was a good basic introduction to 3D landscape software.